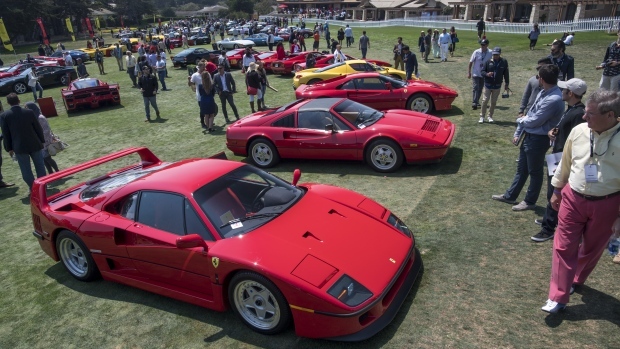 Next week more than 20,000 car enthusiasts will trek to Pebble Beach, Calif., the Pacific peninsula 90 minutes south of Silicon Valley, for one of the most important classic car shows on earth, the Pebble Beach Concours d’Elegance. There will be an aurora-blue 1967 Ferrari 330 GTC Speciale, expected to sell at auction for US$3.3 million to US$3.8 million, and a 1963 Aston Martin DP 215 Grand Touring Competition Prototype, listed for US$18 million to US$22 million. Total auction sales from the likes of Bonhams, Gooding & Co., and RM Sotheby’s are expected to bring in US$342 million this year, up 4 percent from 2017 and the highest since a record US$428 million in 2014, according to Hagerty predictions. But luxury carmakers are increasingly using Pebble Beach as an opportunity to show new cars on the backs of those glamorous old ones. This year, Bugatti will debut a supercar called the Divo. Audi will unveil its PB 18 e-tron electric concept. Mercedes-Benz, Genesis, and Infinity, among others, will show futuristic concepts never before seen. Porsche will display a special 993 911 Turbo called “Project Gold,” said to be a one-off car in partnership with the Porsche Classic Center and Porsche Exclusive and is meant to be auctioned for charity later this fall. Rolls-Royce, too, will host multiple private events at hilltop estates celebrating its US$325,000 Cullinan SUV. Bentley will highlight its new Continental GT coupe with media drives through Big Sur, host exclusive dinners and cocktail mixers, and, for friends of the brand, provide accommodations at the historic golf course’s Inn at Spanish Bay. McLaren will show the US$240,000 600LT supercar, unveiled first at Goodwood, for its North American debut. And Polestar—with its Polestar 1 electric concept a year away from going on sale—will erect a massive display on the hill next to the Pebble Beach Golf Club for the week. This shift comes at the expense of the traditional car shows in Detroit and New York. In recent years, Lamborghini, Ferrari, Bentley, and Rolls-Royce, among others, have declined to show new cars in either of the U.S.’s traditional locations for brands to announce new models. Meanwhile, corporate money from everyone from McLaren to Ford Motor Co. has bloated the size and scope of similar festivals. In July, England’s Goodwood Festival of Speed ballooned to gargantuan levels, with almost 500,000 people attending, swarming in the unseasonal heat under automaker booths erected like Barnum & Bailey tents during the festival’s four-day span. In the U.S., the Detroit Motor Show said that in 2020 it will reschedule its annual show, traditionally held in January, to June in the hope of staving off the bleeding. “It’s pretty black and white: For the same spend, you’re going to sell way more cars at Pebble Beach,” says John Paolo Canton, head of communications for Volvo’s luxury subsidiary, Polestar. Indeed, it costs roughly the same amount—US$1 million or so—for automakers to “do” either a traditional car show or Monterey Car Week (or Goodwood, for that matter). Even companies with nothing incredibly new to show are hosting parties for VIP clients and prospective buyers. Maserati will show an updated Levante; Jaguar will bring the electric I-Pace that it let journalists drive in Portugal earlier this summer. Then there’s Hagerty, a Michigan-based insurance and analysis company aimed at the most desirable collectible and collector cars. Hagerty doesn’t sell any cars at all. But that’s beside the point. When it comes down to it, attending Pebble Beach is about giving the most valuable people in the industry a memorable, fruitful experience—rather than just another trade show. That said, even Ford has let out the rumor that it will show off something new— its iconic GT40 race car—at Laguna Seca racetrack on Saturday before the concours. It’s tough to resist that many car-loving eyes in one place. Of course, even the GT40 will have to compete for attention with the old-car money that attracted everyone in the first place. A 1962 Ferrari 250 GTO listed in RM Sotheby’s Monterey auctions catalogue is expected to sell for US$45 million to US$60 million. It will be the most expensive car ever offered in a public sale.